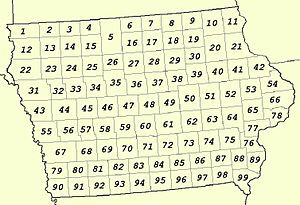 There are 99 counties in the U.S. state of Iowa. The first two counties, Des Moines County and Dubuque County, were created in 1834 when Iowa was still part of the Michigan Territory. In preparation for Michigan's statehood, part of Michigan Territory was formed into Wisconsin Territory in 1836. Two years later, the western portion was split off to become Iowa Territory. The south-eastern part of Iowa Territory became Iowa, the 29th state in the union, on 28 December 1846, by which point 44 counties had been created. Counties continued to be created by the state government until 1857, when the last county, Humboldt County, was created. One of the most significant days in Iowa county history was January 15, 1851, on which 49 counties were created. The Iowa Constitution of 1857, which is still in effect today, states that counties must have an area of at least 432 square miles (1,120 km2), and no county may be reduced below that size by boundary changes. However, exceptions to this rule were granted, as ten counties have areas below this size. (The table below shows land area, but the Constitution deals with total area.) The smallest county (Dickinson) has a land area of 381 sq mi (990 km2), while the largest (Kossuth) has an area 973 sq mi (2,520 km²). Polk County is the most densely populated county at 756/sq mi (292/km2), an increase in density from 2000 when it was 657 inhabitants per square mile (254/km2). Polk County contains the state's capital and largest city, Des Moines. In addition Iowa has one of the fewest number of counties whose boundaries are dictated by natural means, the vast majority of which being formed by lines of survey instead, resulting in a large number of "box counties". The number in the column headed "#" is the one used on the map from the National Atlas of the United States, shown on the left. The Federal Information Processing Standard (FIPS) code, which is used by the United States government to uniquely identify counties, is provided with each entry. The FIPS code for each county links to census data for that county. List of counties in Iowa Facts for Kids. Kiddle Encyclopedia.